In the early summer of 1926, our family decided to move from Los Angeles, back to Lincoln, Nebraska. Although several trips had been made back to my parents home state this trip would be different, because my parents purchased a car for this trip. The used car salesman called it a '24 but we later found out it was a 1923 Star model C touring. Dad was proud of that car and especially liked telling about the features of the car. The Continental "Red Seal" engine was high on his list, along with the speedometer and odometer. The dash mounted spark and throttle levers were also convenient but the real convenience was in the wind wings and sun visor made of blue-green translucent celluloid. Automobile travelers of that era had to be quite self-sufficient as it was not always possible to find a "tourist cabin" in every town. We carried pillows & blankets wrapped inside the tent, a gasoline stove and lantern, and a large wooden box bound to the rear bumper and extending the full width of the car. This box was packed with staple groceries, cooking and eating utensils. This "food box" (which I still have) was fitted with a black oilcloth cover, which my mother made as protection from rain and dust. The tent was specially designed so when raised, one side was open and fitted to the side of the car, thereby joining with the car to form an integral unit. On the first day out, we came upon an unbelievably steep grade east of San Bernardino. In the early days of automobile travel, motorists were very concerned about very long, steep grades. In our case the little "Star" was heavily laden, and the California summer afternoon was extremely hot. We seemed to climb for an eternity in low gear up this steep and narrow grade. Finally, as the grade increased even more, the little engine was no longer equal to the task. My Father managed to hold the car with the brakes while my mother and I and my two-year-old brother got out on the roadway. I remember standing in the dust, watching my mother place a rock behind the engine and popped the clutch, she would carry the rock forward and place it behind the wheel again, to keep the car from rolling back down the grade. Fortunately, we were near the top of the grade, and in that fashion they literally "inched" the car forward to the summit. That night, after the tent was pitched on a windy hill side, I remember listening to the canvas snapping in the wind and wondering what else might be in store for us. Our route ran along what later became Highway 66, but the trails we encountered by no means coincided with the beautifully inked exactness of the map supplied my Father by the AAA. When we reached Topock, on the California-Arizona border, the map showed that we should follow a northerly route to Kingman via Oatman. However, other travelers warned u s of the forbidding "Oatman Hill". It had been raining hard, and there was much debate among other travelers, whether to attempt "Oatman Hill" or drive east and north through Yucca, Arizona instead. My mother prevailed in deciding upon the latter route, and to this day, the name "Oatman Hill" is, for me, synonymous with the unobtainable. During this same rain storm, we came upon a gully, normally dry, which required fording since it was running brim-full with a torrent of water. About ten or twelve cars were lined up on either side, while the drivers tried to muster enough courage to proceed through the water. While courage was being summoned, a local cowboy offered his friendly-assistance for 50 cents per car. One by one, with a rope extending from the car bumper to the saddle horn, the cars entered the water, engines racing. I'm sure the water wasn't terribly deep and there must have been a relatively level gravel bottom, but I remember how terrified I was to see the water washing across the floorboards of the car. However, the Star did not falter, and we proceeded with little assistance from the horseman. I rode in front with father, and can still recall, as we drove on after getting safely through, keeping my eyes fixed on the drying white foam which covered the brake and clutch pedals and my father's boots. At Kingman, Arizona we rented a tourist cabin and spent one day resting while the heavy rain continued. Then, a day or two out of Kingman, on the way to Springerville Junction, we had the one and only automobile "breakdown". After striking some deep ruts in the road, some of the leaves in the right front spring broke, and the fender came down upon the top of the tire. I remember watching my father cut a heavy sapling with an axe, and then bind the sapling to the full length of the spring with bailing wire one of the essential components in tool boxes of the time. We continued our trip all the way to Nebraska with no further attention to the splinted spring. Somewhere in the desert we picked up a young female hitchhiker. My mother wasn't overjoyed about that, and neither was 1, since I was relegated to the back seat until we reached her destination at the next cowtown. Gas stations, or "filling stations" as they were called then, were very primitive; usually just shacks with one pump (hand actuated), bulk oil and radiator water in buckets. At one such desert station we were badly cheated by the attendant. Evidentially he had a return flow valve on the pump, so while some of the gasoline flowed from the glass container to the fuel tank, most of the fuel returned to his storage tank. We only got about 20 miles on that "tankful", but it was too far to go back and demand restitution. Many days out, and nearing dusk, we came upon a steep descent down the side of an arroyo into Socorro, New Mexico. Coming up the grade was one of the local inhabitants driving a burro and large two-wheeled cart. The driver tried to back the burro to a wider place in the road but that proved to be impossible. So my father had to back the car uphill around the shoulder of the arroyo along the unprotected Cliffside. We were certainly getting the "adventure" the family had been looking for. At Raton, New Mexico, we rented a tourist cabin", and the following morning we drove up an incredible grade on the way to Trinidad, Colorado. I remember sitting there by my father, listening to the steady rhythm of the engine and looking out the side of the car at what seemed to be almost straight down to the red roofs of the cabins where we had stayed the night before. I didn't know, of course, that we would soon be entering the Great Plains, and that the mountain adventures were nearly over. 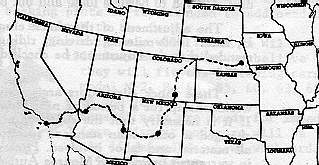 The 2300 mile trip from Los Angeles to Lincoln required twenty-one days driving time. My father kept a daily mileage log the longest driving day was 140 miles, and the shortest was 85. The 21 day average was 110 miles per day, or about 14 miles per hour for each full day's average speed. We kept the Star for two more years, and took one other long trip (from Nebraska straight north to the Canadian border and back in 1928). By then, the little Continental engine had exhausted its limits of endurance. My father exchanged the Star, on an even trade, for a 1918 Overland; but thats another story. 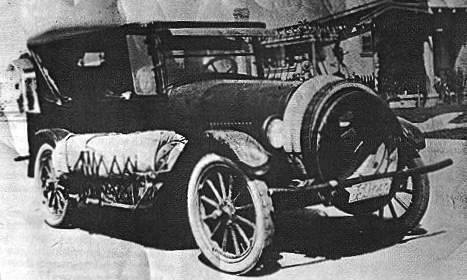 Equipped with four spare tires, the tent securely strapped to the running board and the "food box" fastened to the rear of the car, the little 1923 Star C touring stood, on the morning of departure, prepared to transport Al Eberhart, his brother and parents on a 21-day, 2300 mile journey from Los Angeles to Lincoln, Nebraska back in the early summer of 1926.